Show your local love and pride! 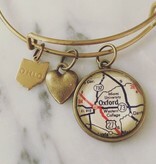 This bracelet is antique brass and includes 1 map charm, 1 brass state charm, and 1 additional charm that varies. Stack these with a bunch of bangles for a real statement. Makes a great gift, too! 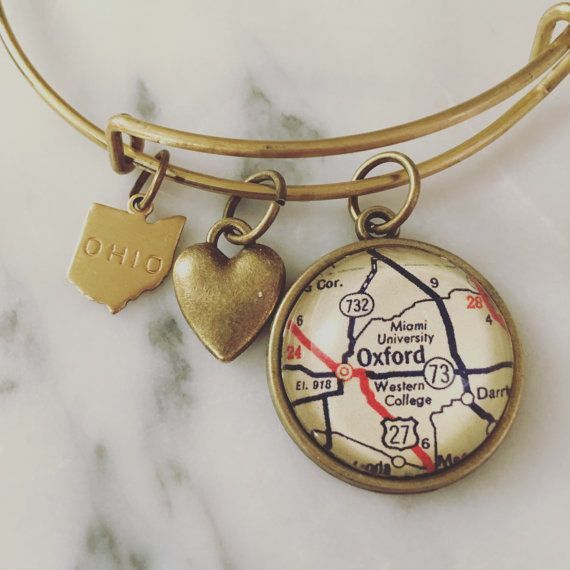 These are handmade in Ohio by a local artisan using real vintage maps so each design is unique. The flying pig charm is a Fleurish Home exclusive!The bracelet is 65mm. Each map will be behind a glass cabochon that measures 20mm each. We do custom too--anywhere in the world that can be found on a map!